Usually synonymous with mass production, the quick response bar code was originally created by Japanese company Denso-Wave to keep inventory. But because QR codes allow for more data than the standard 10-digit bar code, and because scanning requires less effort than typing a URL, QR codes are being embraced world wide for business and personal use. 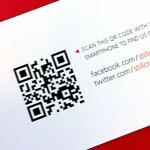 The genius behind QR codes is that they are so simple to use and easy to integrate into print marketing campaigns. They are a great example of how we can link the physical world with the virtual world. There are quite a few QR code reader apps available for download, the trick is to find one that works well for your device. Where should you start looking? Start by checking out our list of 3 awesome QR code readers that we highly recommend. QR codes can directly benefit your business alongside an integrated marketing campaign. Speak with one of our helpful sales reps today to learn more!